FILE - U.S. Secretary of Defense Jim Mattis gives a news conference after a NATO defense ministers meeting at the Alliance headquarters in Brussels, Belgium, June 29, 2017. 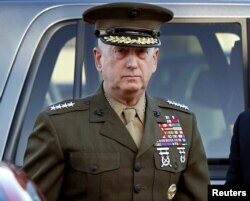 U.S. Secretary of Defense Jim Mattis resigned Thursday following differences with President Donald Trump over policy matters. 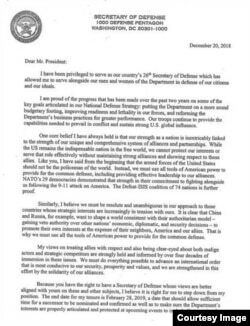 Mattis said in his resignation letter the president has "the right to have a Secretary of Defense whose views are better aligned with yours." 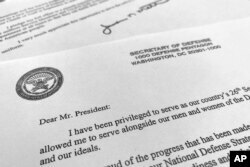 Part of Defense Secretary Jim Mattis' resignation letter to President Donald Trump is photographed in Washington, Dec. 20, 2018. Mattis's decision came one day after Trump announced he would withdraw some 2,000 U.S. troops from Syria, a move the Pentagon opposed. Mattis did not mention the dispute over Syria in his letter, but he did note his "core belief" that U.S. strength is "inextricably linked" with the nation's alliances with other countries. He said he would step down at the end of February. White House press secretary Sarah Sanders told reporters late Thursday Trump and Mattis are on good terms despite not agreeing on foreign policy and other issues. "He and the president have a good relationship, but sometimes they disagree," she said. "That doesn't mean you don't have a good relationship with somebody. He was laying out the reasons he was stepping down from his post." Separately, the director of national intelligence, Dan Coats, said in a statement he was "deeply saddened" to learn of Mattis's resignation. Coats also said "the experience and sound judgement that Secretary Mattis has brought to our decision-making process is invaluable. His leadership of our military won the admiration of our troops and respect of our allies and adversaries." Coats described Mattis as a "national treasure." U.S.-backed forces have made steady progress against Islamic State for several years. 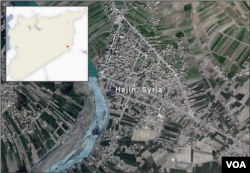 Last Friday, they captured the last remaining Islamic State stronghold in eastern Syria, the city of Hajin, likely prompting Trump's declaration of victory. Trump and Mattis do not agree on the issue. Defeating the Islamic State group was just one of a three-pronged approach Mattis had for Syria that he laid out in August before drawing down U.S. troops in Syria. Mattis said the U.S. must also train local troops who can assume the role of suppressing the militants, and the United Nations peace process must progress toward a resolution in the Syrian civil war. While a relatively small number of troops are involved, their withdrawal will have sweeping consequences in Syria's long-running civil war. Allies will be more heavily burdened with confronting energized adversaries and Turkey, Iran and Russia's influence in Syria will increase. 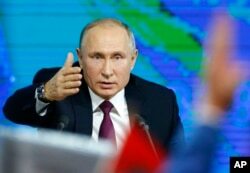 Russian President Vladimir gestures during his annual news conference in Moscow, Russia, Dec. 20, 2018. "Donald's right, and I agree with him," Russian President Vladimir Putin said of the pullout. Within the U.S., lawmakers who reacted publicly expressed concern over the withdrawal and Mattis's departure. "This is scary," said Senate Intelligence Committee Vice Chairman Mark Warner, a Democrat. "Secretary Mattis has been an island of stability amidst the chaos of the Trump administration." Republican Senator and former presidential hopeful Marco Rubio also commented on Twitter after reading the resignation letter. In addition to Syria, there were tensions between Trump and Mattis over Russian President Vladimir Putin. FILE - U.S. President Donald Trump speaks to the news media while gathering for a briefing from his senior military leaders, including Defense Secretary James Mattis (L), in the Cabinet Room at the White House in Washington, U.S., Oct. 23, 2018. Mattis believed the Russian president was trying to undermine NATO and assaulting Western democracies. "[Putin's] actions are designed not to challenge our arms at this point, but to undercut and compromise our belief in our ideals," Mattis told U.S. Naval War College graduates at a commencement ceremony in June. Trump has praised Putin's leadership skills and recently caused concern among U.S. allies by calling for Russia's reinstatement in the group of major industrial nations. Russia was expelled from what was then the Group of Eight after Moscow's annexation of Crimea from Ukraine. Another point of contention between the two men involved the Iran nuclear deal. Mattis argued the U.S. should consider staying in the Iran nuclear deal unless Tehran was found not to be abiding by the agreement. Iran was following the pact's rules, according to the International Atomic Energy Agency, which monitors the use of nuclear energy and has verified Iranian compliance with the accord multiple times since 2015. 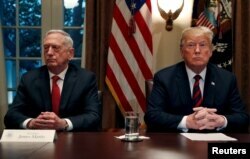 Despite Mattis's position, Trump pulled out of the deal in May, saying it had been poorly negotiated during the administration of former President Barack Obama. As Mattis turned in his resignation, the Defense Department was preparing plans to withdraw up to half of the 14,000 U.S. troops in Afghanistan in the coming months, U.S. officials said. The development marks a sharp departure from the Trump administration's policy to force the Taliban to the negotiating table after more than 17 years of war. Rumors of Mattis leaving the Defense Department have been circulating for months. In October, Trump appeared on the television news show 60 Minutes, where he told TV anchor Lesley Stahl that while "I like General Mattis," he believed he knew more about NATO than his defense secretary. "I think he's sort of a Democrat, if you wanna know the truth," Trump said. "But General Mattis is a good guy. We get along very well. He may leave. I mean, at some point, everybody leaves. Everybody. People leave. That's Washington." FILE - Marine Corps four-star general James Mattis arrives to address at the pre-trial hearing of Marine Corps Sgt. Frank D. Wuterich at Camp Pendleton, California, March 22, 2010. Mattis became secretary of defense shortly after Trump's inauguration and is one of the longest-serving Cabinet members. Before that, Mattis served 44 years in the Marine Corps and led the Marines and British troops during the bloody Battle of Fallujah in Iraq in 2004. Trump Pulling US Troops Out of Syria. Might Afghanistan Be Next?